Andreyko pulls off another impressive and enjoyable issue of Supergirl with his latest effort, although the art this time around is by Eduardo Pansica and Julio Ferreira. They may not be Adam Hughes, but the pair still do a commendable job. Actually, given the plot in this one, Pansica and Ferreira’s style is actually more suited to the story than Hughes’ would have been. It’s a grittier tale, with a few very disturbing moments. 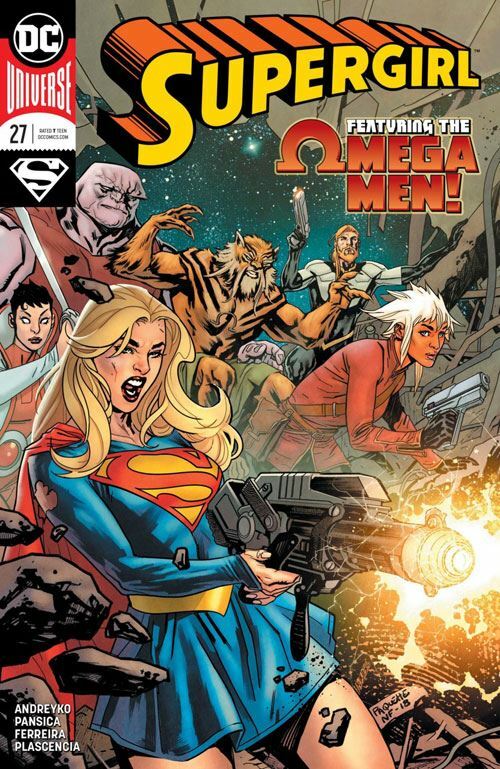 I am not giving too much away by revealing that Harry Hokum has been making clones of the Omega Men. I half suspected as much, with long dead members suddenly returning. It’s a wise decision, as these clones can either wind up taking the place of the lost members, or simply serve as Hokum’s murderous pawns. Andreyko also adds another romance to the story. We are still following the runaway Coluan, Z’ndr, and there are some developments with his backstory. But another Omega Man, one not seen in a very long time, makes a return. I will not reveal who it is, but the sparks fly between him and Supergirl, even if they have no time to express the interest they appear to have in each other. It’s a fast and fun story, building to a great tease for the next issue.